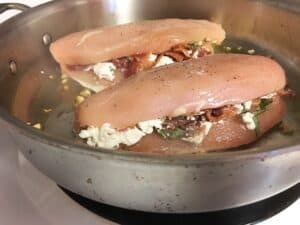 Chicken breasts stuffed with crispy bacon, creamy goat cheese, and fresh basil leaves. Baked in the oven, then topped with a balsamic glaze. An easy healthy chicken dinner recipe that takes only 15 minutes to prepare. Welcome to My Kitchen Serenity! Thanks for visiting! 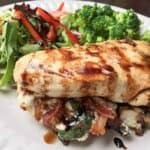 Let’s talk about this Stuffed Chicken Breast recipe! 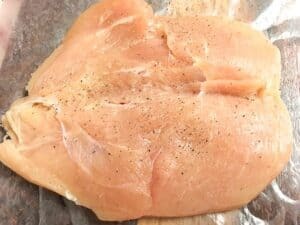 This is an easy baked chicken dinner that you can prepare any night of the week. It’s simple, yet seems elegant. 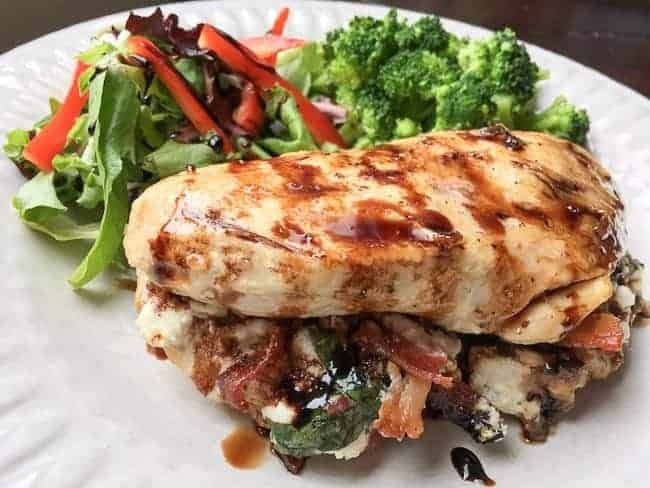 Crispy bacon and creamy cheese baked inside a boneless skinless chicken breast. Simply yummy! And if you happen to be interested in low carb, or keto, this versatile recipe fits those categories. Sign up for our member's list to make sure you never miss another delicious recipe from My Kitchen Serenity! You can unsubscribe at any time, but why would you want to do that? Thank you so much for signing up! Remember, you can unsubscribe at any time. Carefully butterfly each chicken breast by running a sharp knife, like this one, horizontally through the thickest part of the breast but not all the way through. Both sides of the breast should lie flat on the surface. Sprinkle with salt and pepper. Add some bacon, goat cheese, and basil leaves on one side of the breast. Fold the other half of the chicken breast over, then secure with a toothpick if desired. When finished stuffing the chicken breasts, brown each side in an oven-safe skillet, like mine. Place skillet in a preheated 375F oven and bake for about 25-30 minutes or until chicken reaches 165 degrees. A few minutes before the chicken is done, prepare the balsamic glaze. Serve with your vegetable(s) or side(s) of choice, depending on your eating plan (if any). 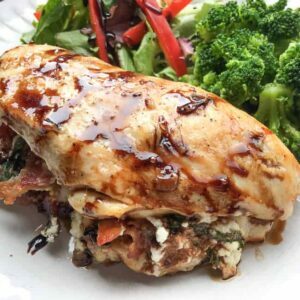 Chicken breasts stuffed with crispy bacon, creamy goat cheese, and fresh basil leaves. Baked in the oven, then topped with a balsamic glaze. Preheat oven to 375F. Carefully butterfly each chicken breast by running a sharp knife horizontally through the thickest part of the breast but not all the way through. Both sides of the breast should lie flat on the surface. Sprinkle with salt and pepper. 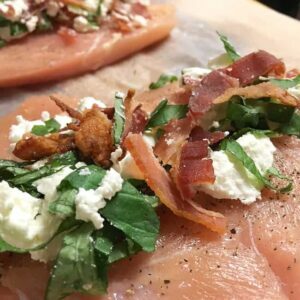 To each chicken breast, add 1/4 of the bacon, 1/4 of the goat cheese, and 1/4 of the chopped basil leaves on one side of the breast. Fold the other half of the chicken breast over, then secure with a toothpick if desired. When finished stuffing the chicken breasts, brown each side in an oven-safe skillet. Place skillet in oven and bake for about 25-30 minutes or until chicken reaches 165 degrees. A few minutes before the chicken is done, prepare the balsamic glaze. Place the balsamic vinegar in a small saucepan over medium-high heat. Stir until the vinegar is reduced by 1/3. It will start to form a thick, syrup-like consistency. To serve, place chicken breast on plate and drizzle glaze on top. I hope you enjoy this stuffed chicken as much as we do. If you make this recipe, leave me a comment and let me know. I’d love to hear from you. Great recipe but what is the oven temperature for the 25-30 minutes baking portion? Hi Jane! The oven should be preheated to 375F. I have fixed the recipe. Thank you for asking! I hope you enjoy this recipe. Thank you for your prompt response. Much to my adult son’s displeasure, I cook too much chicken :D. This should make him happy. I know I will be (not just baked chicken again!). Will be going to the supermarket soon to get the ingredients. P.S. I’ve never had goat cheese before. You’re broadening my horizons and I welcome it. Thanks for featuring my recipe on this week’s Meal Plan Monday!